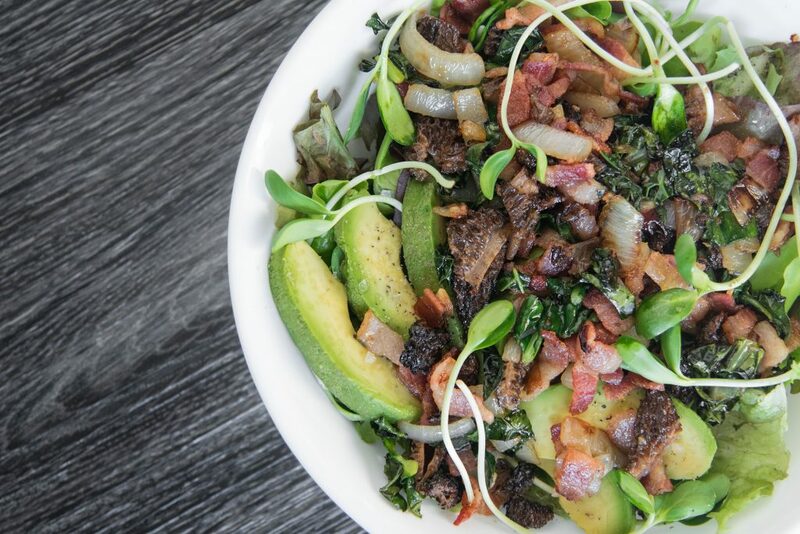 Morel Mushroom Salad with Bacon is bursting with crisp salad crunch and rich umami flavor. Tastes gourmet, but is so simple! I have become a procrastinator. Well, maybe that isn't entirely accurate, I think the problem is I have so many jobs that everything goes on lists, and then I lose the lists and I feel like I am flailing and failing. Then I need to start a new list, and right at the top put “FIND LISTS”. I always have the feeling like I should be doing something. Like this recipe, I bought BEAUTIFUL fresh morels from the farmers market. Did you know that morel mushrooms can't be cultivated? They have to be hunted and gathered (so primal right?? ), so you can assume that they are a little more expensive than the average mushroom. And then those stunning mushrooms, died a slow, sad death waiting for me in the fridge. 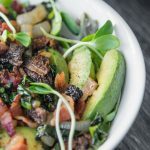 We made a couple dishes with our exotic hunted morel mushrooms including our Primal Stuffed Morel Mushrooms, and I decided that this recipe for the Morel Mushroom Bacon Salad needed to go on the site. But we were out of fresh morels. We only had dried morels left in the fridge, so I bought some more! Sound like a good idea? Sure was! I mean fresh morels are always better, right? But then my day job blows up and I find myself spending 4 hours a day in my car, on top of long days, and the morel mushrooms sat neglected in the crisper of the fridge. When I finally had the time to pull out those mushrooms and get to work… well, it wasn't pretty. The paper bag they were in was a little on the moist side, never a good sign. I unrolled that bag and peered inside, and the smell coming up from the freshly opened bag, was, not so fresh. I rolled the bag back up, walked out the back door and straight to the compost pile. I said a few kind words and said my final goodbye before lowering my once fresh morels into the great compost pile. So now what? Do I risk buying more? Do I abandon this beauty of a recipe? Heck no! I used the dried morels. Which makes this recipe good with fresh or re-hydrated dry morels. Morels are crazy in that when you rehydrate them (I always recommend you soak them) they look and feel as if they are fresh! A quick rabbit hole here, why do they put the crispers on the bottom of the fridge? At least in our old beauty of a fridge, those drawers are way at the bottom, and it is the place that fresh produce goes to die. A produce retirement home, but not a nice one that feels like a resort. A lockdown institutional feel. Maybe we need a new fridge design? One that showcases the beautiful organic produce I buy? Maybe with a spotlight and turnstile. The “morel” of this story… (hahaha) if you aren't sure you will use your mushrooms right away, dehydrate or dry them!! Really this is good advice for other fresh fruits and veggies too (yes I said veggies. Watch for a recipe for this towards fall). Have you tried our Pineapple Chips with Guacamole? 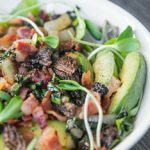 Morel Mushroom Salad with Bacon is great with fresh or rehydrated morels, and is not only easy but super delicious! If you give it a try we would love to see! Follow and tag us @theprimaldesire on any social media, Facebook, Instagram, or Twitter! 2 cups mixed greens, or whatever you like, if you want all butter lettuce I won't judge you. Place dried morels in the salted warm water to rehydrate them. (around 20 minutes should be good). If you are using fresh morels you can skip this step, but I would still let them sit in salted water to remove any slugs, bugs, and ash, so they aren't gritty. Drain well and I chopped them. Over medium heat start cooking the bacon. Once the bacon starts releasing some grease, at about halfway, add the garlic, onions, morels, and kale. Lay your bed of greens and veggies out and add the cooked mixture over top. Morel mushrooms MUST be cooked, you cannot eat them raw. Eating raw morels may make you sick, and they don't taste as good. MAny mushrooms have a toxicity to humans until they are cooked. I found that the sauteed bit on top of this salad gave it enough flavor that I didn't need dressing, but feel free to add some if you feel you need it! Maybe our paleo ranch?